Today’s post is a little different than the norm, but I wanted to share one of our favorite annual outings with you. Living in Eastern Canada, sugaring off is a part of our family’s food culture. We can smell the maple syrup as soon as we pull up to the farm house. The sun warms my face as I exit the car and glancing up, I spot a lazy column of smoke rising from the forest. Danny, Noah, Mateo and I duck inside the family home where Aunt Lynn looks up from the maple pecan pies she is taking out of the oven. She smiles as we unload about half the entire contents of our home from the car and trek everything into the guest room. We’ve all come for one thing: sugaring off. 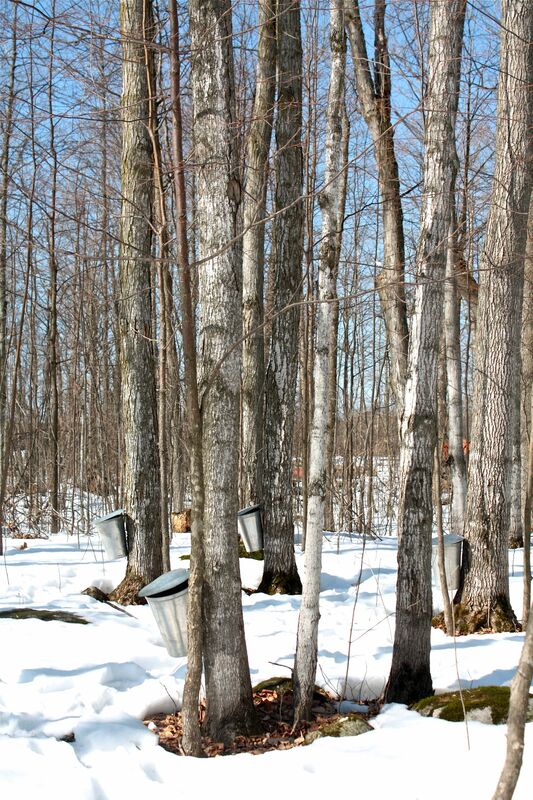 During these warm spring days and cool nights, the sap is running in Lynn and Marc’s 25 acre ‘sugar bush’. The maple trees have been tapped and the process of collecting and boiling the sap is in full swing. On the kitchen counter sits an industrial-sized canning pot with at least two gallons of dark maple syrup in it. A ladle hangs on the side and a jar of spoons next to the pot invites us to partake. Unprepared for just how good it is going to be, I dip into the pot and spoon out a generous tablespoon. The dark amber syrup warms my throat, tasting complex, like a fine wine. Underneath the sweet maple taste is another level of flavor that tastes smoky, and hints of moss and earth. It’s like nothing I’ve ever had before. “What? What? How…?” I splutter. Lynn explains that the superior flavor is due to the fact that the sap has been boiled in the traditional method – over an open wood fire in the middle of the forest. I’ve camped enough in my life to get that; an oven-baked potato and a campfire-roasted spud are worlds apart. I surreptitiously tuck the spoon into my pocket (one wants to always be prepared, doesn’t one?) and we exit the house, strike out into the woods, past a decrepit wooden outhouse, following the slushy trail and the sound of barking dogs. Young saplings are interspersed with strong tall maples on either side of the path and almost every mature tree has a tin bucket hanging from it. Through the forest I can see a hub of activity. A pile of old wooden pallets towers precariously next to a massive cast iron stove; they are the fuel for the fire that reduces the sap. A couple of quads are parked nearby and the very sight of them causes Noah’s five-year-old footsteps to quicken. He is a boy for sure. As we enter the clearing, aunts, uncles, cousins and siblings greet us with a traditional two-cheek kiss. Someone takes Mateo from my arms and another offers me a tin cup of chili. It is Uncle Marc’s homemade maple-venison chili, incredibly flavorful, smoky & sweet–and yes, he harvested the deer himself. A table stands amid the trees, it’s legs thrust into a foot of snow. On it sits a naked turkey (awaiting it’s bath in the oil that is heating nearby), a few drinks, and some baked goodies. Looks like we’re not going to starve. Next to a small campfire, I take a seat on a freshly cut section of log, and size up the nearby stove. It is enormous. A fire rages inside, fueled by the wooden pallets and fresh oxygen. 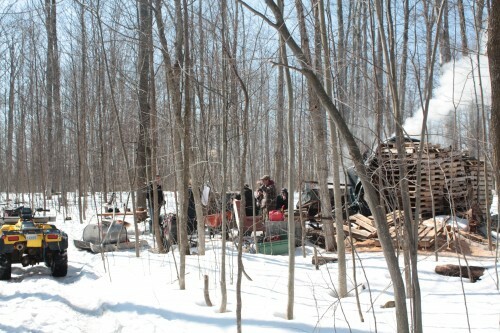 On top of the stove is a massive metal box, bigger than most bathtubs, and it’s half full with maple sap. 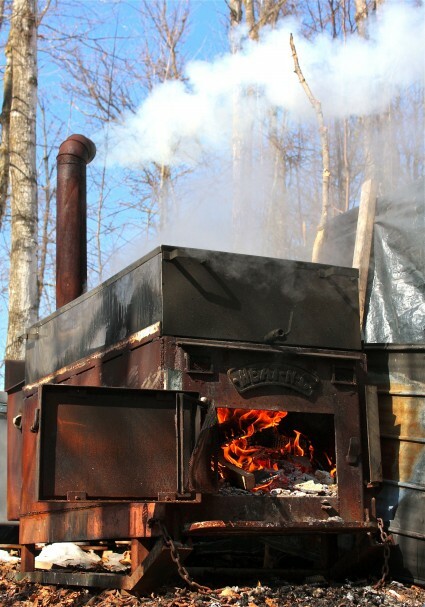 Steam rises from the top as the sap boils rapidly, reducing itself to the precious syrup. It takes 40 gallons of sap to make one gallon of maple syrup, and out here in the fresh spring air is where the magic happens. The fire doesn’t go out until the sap stops running. Buzzed from the jolt of maple from the house, and warmed by the chili, I’m raring to go. Noah has already disappeared into the trees with his grandpa and, childless for the moment, I jump at a chance to tap some trees. Armed with a drill, buckets and taps, a group of us hit the trail. In an interview with the National Post, Montréal chef Martin Picard calls maple syrup “…extraordinary, underestimated, and the most emblematic product you can find in Canada.” From the clear, perfumed sap that drips from the tap on the tree trunk, to the seductive dark syrup that coats our pancakes, this is truly Eastern Canada’s most valuable resource. I hear voices through the woods and recognize Noah’s among them. In our wandering from tree to tree, we’ve happened upon a frozen swamp with a group of cousins on it, sliding and laughing in the sun. It’s a charming spot, the smooth ice spreading through the trees creating many little frozen islands. Christmas lights encircle the pond, making for a very picturesque setting. The dogs run, barking, from child to child as they play. There’s not a car to be heard or a house to be seen. Even the air smells sweet. Truly, this is roughing it with side benefits. Back at camp, like on Christmas Day, the goodies just keep coming. A deep-fried turkey glistens on a carving board and I help myself to a slice of the juicy breast. It goes in my tin cup, along with baked beans that have been cooking on the wood stove all morning, and everything gets bathed in maple syrup. Soon Uncle Marc makes his way down the trail with a steaming kettle in one hand and a can of wooden paddles in the other. He side-skirts the bustling stove area and heads for a patch of clean snow in the woods instead. My foodie instincts propel me, and true to form, I am first on the scene. He’s making maple taffy or ‘tire d’érable‘. 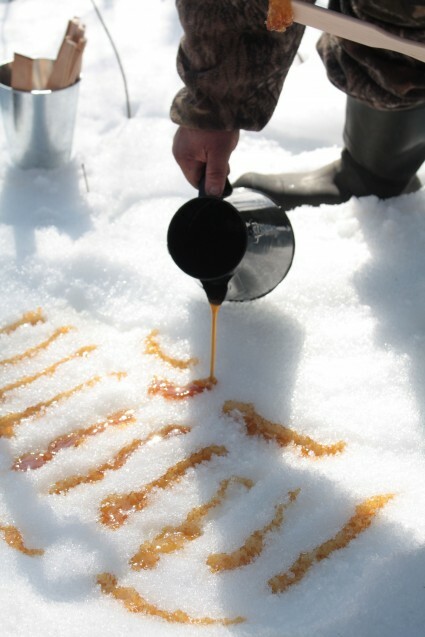 He has reduced the pure maple syrup until it thickens and now pours it on the snow in long strips. The taffy hardens–but not too much–and then is rolled onto a paddle; this lollipop of pure delicacy is handed to the closest awaiting hand. Like mother, like son. It hasn’t taken Noah very long to discover this snow buffet. He neatly devourers all of the tire on his stick in one massive sticky bite. I brace myself for all twenty of his tiny, pearl-white teeth to rot out of his head and drop into the snow. I cap his intake at two, but proceed to have four more sticks of taffy myself. Sugaring off comes but once a year, after all. By now, Mateo has succumbed to the warm afternoon sun and is dozing in the jogger stroller. My heart is racing from the pure sugar fix and I’m ready to see how the sap is collected. I hop on the back of the ATV, which is pulling a large barrel on a sled that will hold the sap, and a handful of us set out to collect the sap. We stop at various ‘checkpoints’ along the trail and, armed with 5 gallon pails, fan out into the woods. Each and every tin bucket is lifted from the tree and the contents dumped into the 5 gallon pails, which in turn are emptied into the barrel on the sled. It’s joyous work. There are few things as satisfying as harvesting nature’s plenty, without risk to the environment, in a similar manner as generations have done before us. When we return to ‘camp’, I don’t stick around to see the sap transferred from the barrel to the stove top, because I’m badly in need of coffee and I’m off to hunt some down. As quickly as it came, my sugar rush has left, taking my energy stores with it. I’m pleased to see the homestead kitchen is a bustle of activity and there are many signs of a promising feast to come. Baked beans (with maple syrup of course) are bubbling on the stove, six dozen eggs are stacked on the counter awaiting their destiny, and pork in its many attractive forms is warming, including about five pounds of maple-glazed bacon contributed by yours truly. Some things are essential, and bacon is one of them. My sister glances up from the griddle where she’s turning out apple-cinnamon pancakes with skill. I’m famished. She doesn’t object as I snitch one. 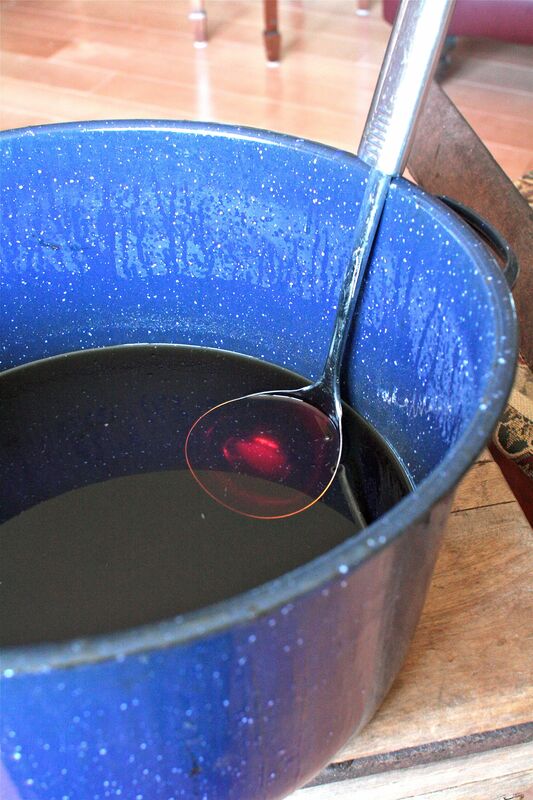 The blue bucket of fresh maple syrup stands by, awaiting to douse everything, as is the custom. 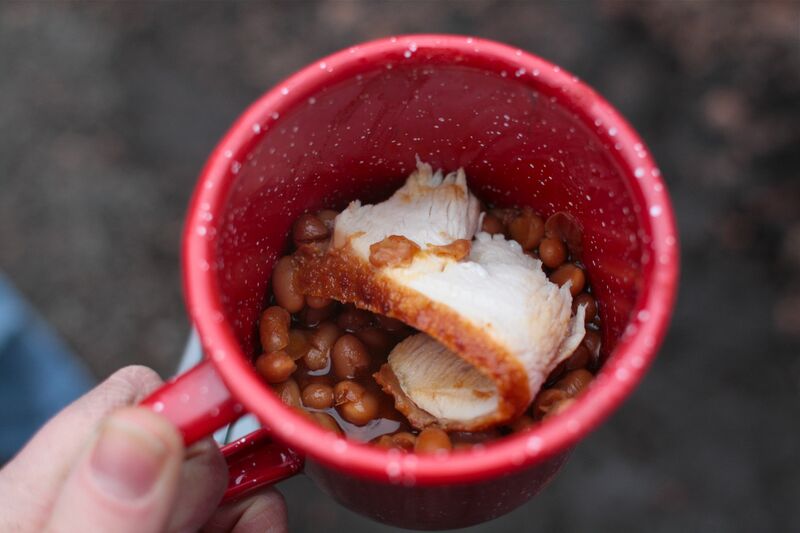 There’s nothing like fresh air to help work up an appetite and this is apparent as we devour the aforementioned baked beans and flapjacks in addition to scrambled eggs, bacon, ham, bison sausages, coffee cake, bagels and hash browns. 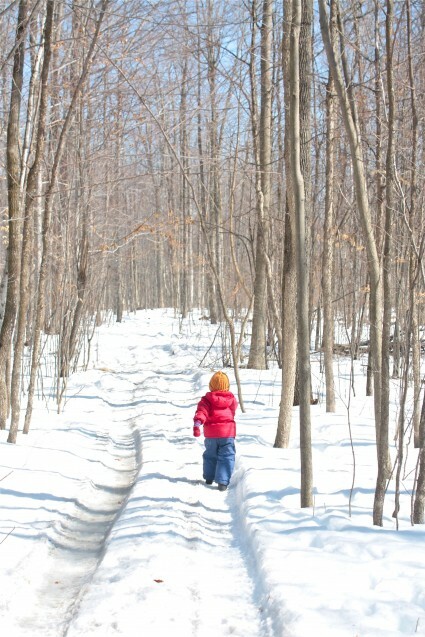 Everything is topped with maple syrup; a tribute to our day in the sugar bush. She gestures at the view, which doesn’t require anyone to speak for it. It’s stunning and the display has not been lost on me. This whole day had only been a reminder of what I already knew: ‘You can take the girl out of the country, but you can’t take the country out of the girl’. The children are tired and sticky and we have a long drive ahead. We make our rounds to say goodbye, collect our scattered belongings, and load the car. The smoke continues to rise from the forest as we turn the headlights toward home. 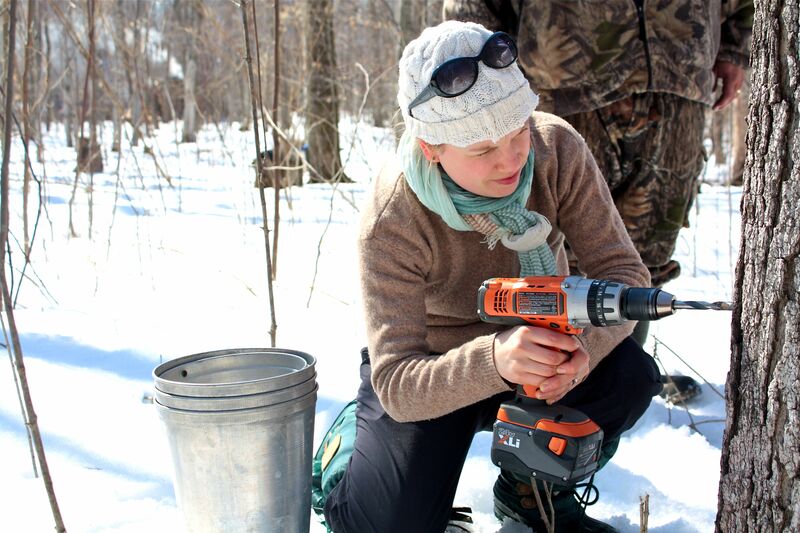 I had to come from your current blog post and come back here to read about the sugar bush. This takes me back close to 60 years growing up in Southwestern Ont. Our neighrbors across the road had a sugar bush where we visited during spring. One of them stayed back in the bush day and night tending the fire. Such vivid memories!